Complicated urinary tract infections (UTIs) occur in the setting of a urinary tract that has metabolic, functional, or structural abnormalities. Complicated UTIs may involve both lower and upper tracts .Their primary significance is that they significantly increase the rate of therapy failures. A growing number of complicated UTIs are healthcare associated in origin. The most common pathogens include Escherichia coli, enterococci, Pseudomonas aeruginosa, candidal species, and Klebsiella pneumoniae. 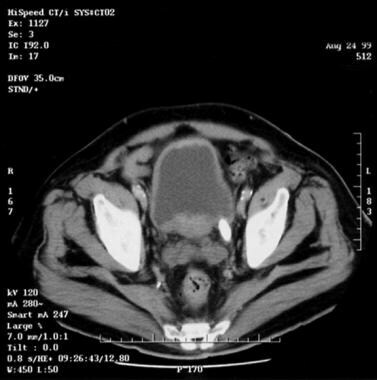 Patients with a neurogenic bladder or bladder diverticulum and postmenopausal women with bladder or uterine prolapse have an increased frequency of urinary tract infection because of incomplete bladder emptying. This eventually allows residual bacteria to overwhelm local bladder mucosal defenses. Autosomal dominant polycystic kidney disease can lead to end-stage renal disease. Cysts may become infected from either bacteremia or bacteriuria. In patients with diabetes mellitus, high urine glucose content and defective host immune factors predispose to infection. Hyperglycemia causes neutrophil dysfunction by increasing intracellular calcium levels and interfering with actin and, thus, diapedesis and phagocytosis.Associated vaginal candidiasis and vascular disease also play a role in recurrent infections. For more information on this topic, see the Medscape Reference article Urinary Tract Infections in Diabetes Mellitus. Calculi related to UTIs (see the image below) most commonly occur in women with recurrent UTIs from Proteus, Pseudomonas, and Providencia species. Bacterial biofilms serve to assist struvite growth. Because magnesium ammonium phosphate is acid soluble, stone formation does not tend to occur with a urinary pH lower than 7.19. Nonobstructing distal left ureteral calculus 2 × 1 × 2 cm. Increases in ammonia raise the pH and injure the uroepithelial glycosaminoglycan layer, enhancing bacterial adherence. Alkalinity also increases the amount of phosphate and carbonate available to bind calcium and magnesium and so promote stone formation. Acute focal bacterial nephritis is also known as acute lobar nephronia or focal pyelonephritis (see the image below). This is an acute bacterial interstitial nephritis affecting a single renal lobe. Multiple abscesses, upper pole of left kidney. Xanthogranulomatous pyelonephritis is a severe chronic infection of the renal parenchyma. The kidney is enlarged and is fixed to the retroperitoneum by either perirenal fibrosis or an extension of the granulomatous process. The inciting event in xanthogranulomatous pyelonephritis appears to be renal obstruction leading to a chronic UTI. Predisposing factors include renal calculi, lymphatic obstruction, renal ischemia, dyslipidemia, diabetes, and primary hyperparathyroidism. .The pathological hallmark is the lipid-laden macrophage. This most likely represents a defect of intracellular killing. The chronic inflammation leads to massive destruction of the kidney. Renal corticomedullary abscesses usually are associated with vesicoureteral reflux or urinary tract obstruction, and the usual organisms include Escherichia coli, Klebsiella species, and Proteus species. Clinical syndromes include acute focal bacterial nephritis, acute multifocal bacterial nephritis, emphysematous pyelonephritis, and xanthogranulomatous pyelonephritis. Renal cortical abscesses (ie, renal carbuncles) usually result from hematogenous spread of bacteria. Primary sources of infection include skin infections, osteomyelitis, and endovascular infections. These are observed commonly in users of injection drugs, people with diabetes, and patients on dialysis. The most common organism isolated is Staphylococcus aureus. Ten percent of cortical abscesses may rupture through the renal capsule and form a perinephric abscess. For more information on this topic, see the Medscape Reference article Urinary Tract Infections in Pregnancy. Wagenlehner FM, Cek M, Naber KG, Kiyota H, Bjerklund-Johansen TE. Epidemiology, treatment and prevention of healthcare-associated urinary tract infections. World J Urol. 2012 Feb. 30(1):59-67. [Medline]. Johansen TE, Botto H, Cek M, et al. Critical review of current definitions of urinary tract infections and proposal of an EAU/ESIU classification system. Int J Antimicrob Agents. 2011 Dec. 38 Suppl:64-70. [Medline]. Chen SL, Jackson SL, Boyko EJ. Diabetes mellitus and urinary tract infection: epidemiology, pathogenesis and proposed studies in animal models. J Urol. 2009 Dec. 182(6 Suppl):S51-6. [Medline]. Michaeli J, Mogle P, Perlberg S, Heiman S, Caine M. Emphysematous pyelonephritis. J Urol. 1984 Feb. 131(2):203-8. [Medline]. Xanthogranulomatous pyelonephritis. Lancet. 1985 Sep 21. 2(8456):649-50. [Medline]. Huang JJ, Tseng CC. Emphysematous pyelonephritis: clinicoradiological classification, management, prognosis, and pathogenesis. Arch Intern Med. 2000 Mar 27. 160(6):797-805. [Medline]. Kim SW, Yoon BI, Ha US, Sohn DW, Cho YH. Xanthogranulomatous pyelonephritis: clinical experience with 21 cases. J Infect Chemother. 2013 May 25. [Medline]. 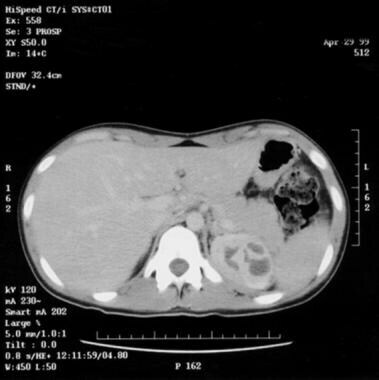 Wickre CG, Major JL, Wolfson M. Perinephric abscess: an unusual late infectious complication of renal biopsy. Ann Clin Lab Sci. 1982 Nov-Dec. 12(6):453-4. [Medline]. Gozdas HT, Karabay O. The incidence of peri-renal abscess in urinary tract infections. Infection. 2013 Feb. 41(1):283. [Medline]. Jones LA, Woodman PJ. Urinary tract infections in pregnancy. Medscape Reference [serial online]. [Full Text]. Smaill F. Asymptomatic bacteriuria in pregnancy. Best Pract Res Clin Obstet Gynaecol. 2007 Jun. 21(3):439-50. [Medline]. Fisher JF, Kavanagh K, Sobel JD, Kauffman CA, Newman CA. Candida urinary tract infection: pathogenesis. Clin Infect Dis. 2011 May. 52 Suppl 6:S437-51. [Medline]. Can Omega-3 Fatty Acid and/or Vitamin D Supplementation Reduce Cancer or CVD Risk?